Layang Layang is a 3 star resort built out of tropical hardwood and architecturally modelled in the traditional longhouse style. The resort buildings including the restaurant and Raba Raba massage centre curve around a central swimming pool, facing out towards the coral lagoon and which is a great place to unwind. Winner of our Dive Operator of the Year award 2016, the resort offers you both comfort and a unique cultural perspective. Easily the biggest drawcard for this island, is the world famous and enthralling encounters with schools of scalloped hammerhead sharks in its surrounding waters. Being lucky enough to watch a big school of hammerheads glide by is an experience that will live with you for a very long time, and makes the whole journey worthwhile. But often overlooked by divers in their eagerness to catch sight of the sharks, is the other marine life on display. The coral health and diversity at Layang Layang is simply superb. Mantas also frequent this deep water area, and you just never know what might show up. Guests can enjoy unparalleled scuba diving with unlimited shore dives as well as enjoy the sights and sounds of the protected bird park on the island. 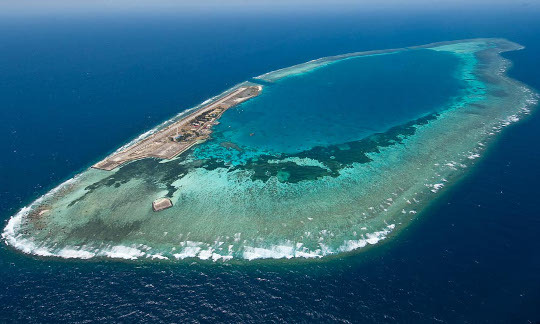 Layang Layang Island Resort is the only diving operator and hotel accommodation available on this small coral atoll in the South China Sea. Single travellers cannot share accommodation and must pay a single person price. Numbers are very limited due to the low availability of flights, so if you want to share in this breathtaking wonder, we suggest you plan your trip well in advance - book early! The Layang Layang Island Dive Resort is open from March through until June. It is necessary to book your stay at the resort and provide copies of passport and diving license more than 14 days in advance, in order to allow time for island permit applications and domestic flights reservations. Destinations: Layang Layang (Diving environment: wall diving, healthy reefs, advanced divers, off the beaten track; Highlights: hammerhead sharks, turtles, schooling fish/big pelagics). Resort diving includes: Dives (as detailed in the packages above), unlimited self-guided shore dives, boat rides to sites, experienced English-speaking divemaster (maximum 10 divers per DM), tanks, weights and weightbelts, drinking water, hot drinks. Goods & Services Tax (GST 6%) is included in our prices (unlike some other agency websites that you might visit). Diving excludes (mandatory, unless customer provides own): Scuba equipment (approx. US$ 58 per day). Unless otherwise stated, all the listed items need to be paid on arrival (cash or credit card). Optional extras: Extra boat and boat dives, dive computer, dive insurance, soft drinks. Unless otherwise stated, all the listed items need to be paid on arrival. 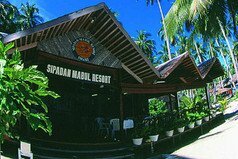 Resort accommodation includes: Bed, breakfast, lunch, dinner, drinking water, hot drinks, return resort transfers from Layang Layang airport, internet access. Goods & Services Tax (GST 6%) is included in our prices (unlike some other agency websites that you might visit). Optional extras: Soft drinks, alcoholic drinks. Unless otherwise stated, all the listed items need to be paid on arrival. How to get there: The resort is located on a tiny atoll in the Spratly Islands in South China Sea, midway between Borneo and Vietnam. Layang Layang is a 1 hour flight north of Sabah's capital Kota Kinabalu and your package to stay requires a return flight from there. There are regular special charter flights to Layang Layang from Kota Kinabalu (US$ 470, return flight per person, including airport taxes and 6% GST). You'll need to check with us for flight availability as the aircraft are small and flights are not available online, nor do they operate every day. We will handle the booking for you as part of your holiday booking. The current schedule has flights from Kota Kinabalu to Layang Layang at 05:30 am, with return flights at 07:10 am. Please be at Kota Kinabalu Airport Terminal 1 at least one and a half hours before flight departure. Please book your departing connecting flight at least 4 hours after expected time of arrival at Kota Kinabalu. Please note that there is a 25 kg maximum baggage allowance on the flight between Kota Kinabalu and the island. 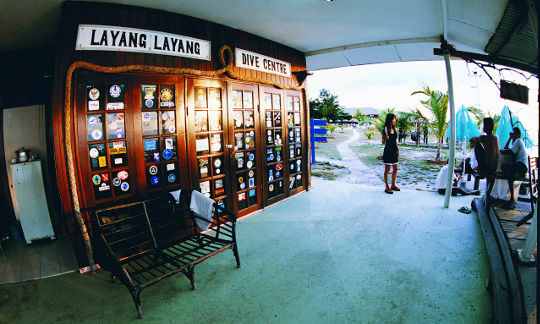 Scuba divers visiting Layang-Layang should attempt to keep their baggage for the trip down to a minimum; non-essential luggage can be stored on the mainland. Kota Kinabalu International Airport has direct flight routes to Malaysia's capital Kuala Lumpur, as well as with Bangkok, Brisbane, Hong Kong, Tokyo, Seoul, Taiwan, Kaoshiung, Singapore, Manila and Brunei. 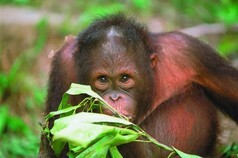 Add-on package: If this is your only planned visit to Malaysian Borneo then we strongly recommend that you consider a 2 night add-on stay at the Sepilok Nature Resort, Sandakan in Sabah, to allow you to witness the not-to-be-missed jungle adventures with orangutans. 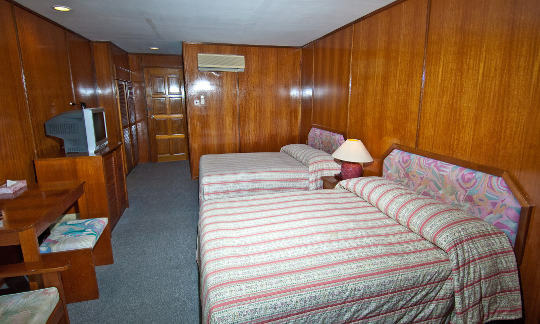 There are 46 Standard twin share rooms 6 Deluxe rooms and 1 Suite room, all constructed from tropical hardwoods. Deluxe Suites are much larger, have a bath, a balcony with table and chairs, and a walk-in wardrobe. You can upgrade rooms only upon arrival at the resort. 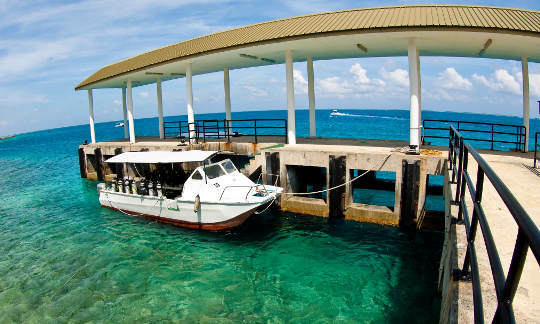 Layang Layang Island Resort has a scuba centre with a fleet of 10 catamarans at its disposal. 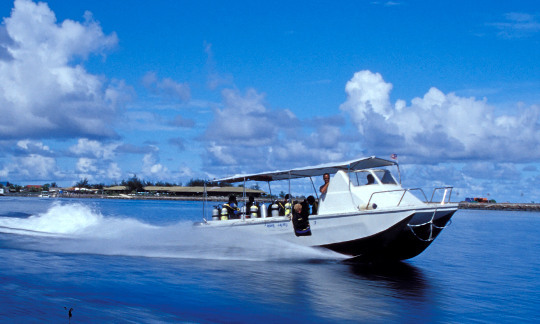 All dive sites on the island atoll can be accessed within 5 to 25 minutes. The powerful catamarans are designed for a maximum of 12 divers with a divemaster. They have twin 4-stroke 90 HP Honda engines, a kit-up area, shaded area and steel ladders for exiting the water. 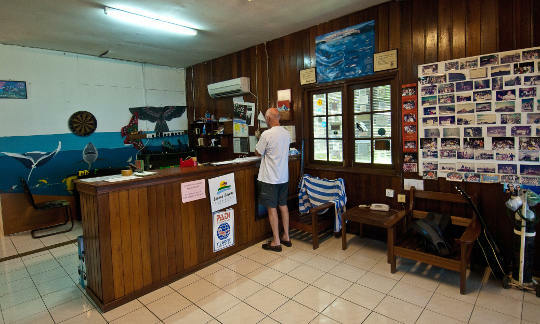 The dive centre has equipment stations for all scuba divers, with hangers, booty pegs, fresh water shower, and rinse tanks for scuba equipment and cameras. As part of their service, all you're asked to do is wash your own wetsuit! Unlimited beach diving is possible, free of charge, with your own dive buddy. Night boat dives can be arranged at the resort. The resort practices a strict environmental conservation policy and requires all divers to agree to its Reef Conservation Policy set up under its Environmental Conservation Programme. The English translation of the phrase Layang Layang means "Swallow's Reef" and bird watching is a favourite activity between dives. While the bird life is prolific, you will not see any swallows, but noddy terns, sooty terns and brown boobies all have nesting colonies here. 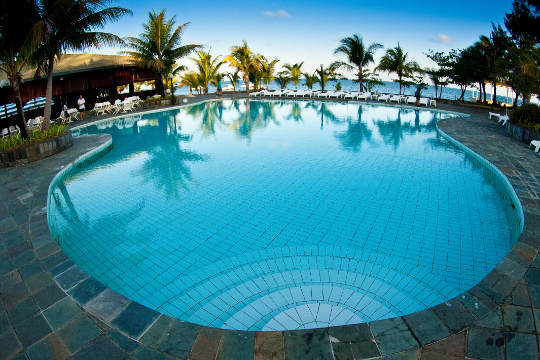 Additionally, the lagoon provides snorkelling and sea canoeing, and the resort offers a full size swimming pool for your use. 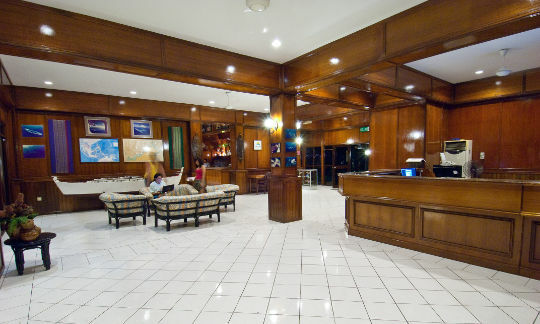 For more sedate pastimes, you can play pool, bar football, or surf the internet with the resort's free wi-fi facility. The Raba Raba House massage centre is the perfect recuperation after a hard days diving or walking in the bird park; try foot reflexology or a simple muscle massage. 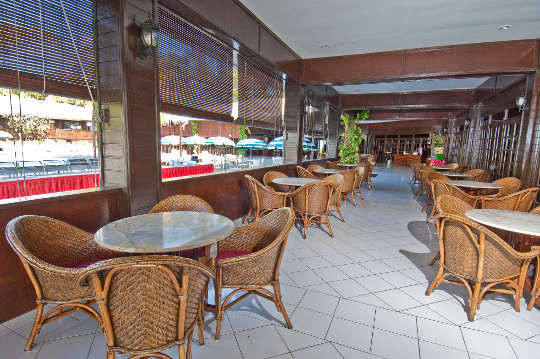 There is also a full bar in the reception lounge - a great place to have cocktails while overlooking the sunsets on the lagoon. 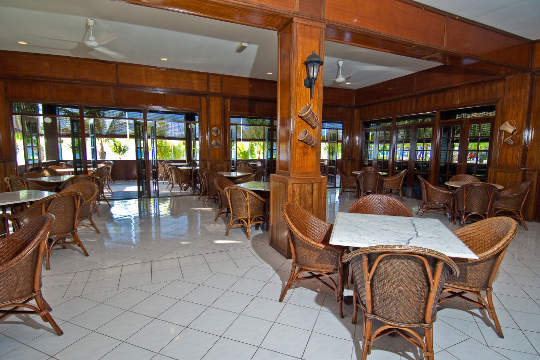 Resort facilities include: Restaurant - Bar with TV - Swimming pool - Bird island - Complimentary Wi-fi in lobby and restaurant - Canoes for hire - Pool table - Bar football table - Hammocks - Laundry service - Gift shop. Unfortunately, the island doesn't have any beaches. So, if you have a non-diving partner joining you on this trip, it may be a better idea for him/her to stay at home or holiday in another destination. 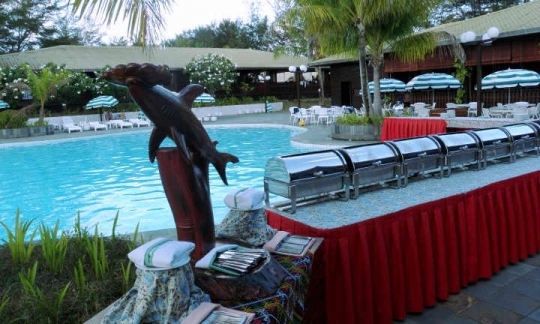 The resort's restaurant offers East meets West cuisine, in the air-conditioned canteen or open-air at the poolside. Meals are laid out 5 times a day at the buffet table, so you can eat as much (or as little) as you want. Some sample dishes - curried prawns, Chinese style chicken, beef in black pepper sauce, grilled lamb, fish n chips, pasta, deep fried fish, crab sticks. Some sample desserts - chocolate gateau, banana cake, apple crumble, fruit jelly, red beans in sweet coconut milk. Complimentary breakfast - fruit drinks, coffee, tea, toast, cereals, rice porridge, eggs, beef sausages, egg noodles, baked beans, hash browns, chicken nuggets, fried fish. 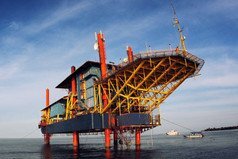 In the event that you suffer from decompression sickness while on Layang Layang, you will be transferred by airplane from the island to Labuan, 350 km away, where there is a decompression chamber. Layang Layang Island Resort provides customer diving insurance for evacuation and chamber treatment within Malaysia only. If you would rather have cover that includes treatment back in your country of residence, then we recommend you take out your own dive insurance policy and bring details. Oxygen, a first aid kit, fire extinguisher, life jackets, and a divemaster are provided for each catamaran. The resort also has a sick bay, fully equipped with further oxygen and medical supplies. The Malaysian Navy also have a base on the island, so you can go diving in the very safe knowledge that armed security is always present - no boats are allowed within a certain area without permission. 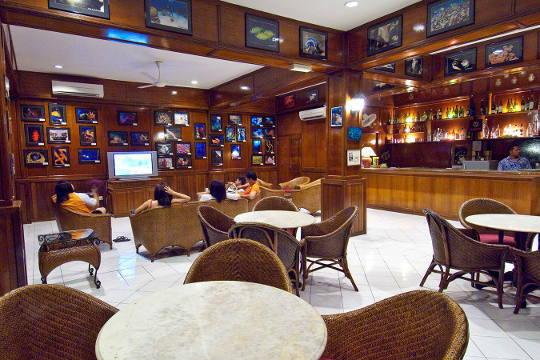 "The resort is clean, in an awesome landscape and well organized for divers. All the activities are focus around diving. The diving center area is massive ready to host many divers. The speed boat system make every dive easy, fast to reach the spot , in small group and the locals are very efficient to take care of my dive kit. The dive guides are very professional and careful especially for the dive in the blue when we are searching for hammerhead sharks. "Everything was well organised, all the staff were friendly and warm, they were all eager to help. Diving was great, I had to hire equipment and this was all good though I understand most divers bring their own stuff. My dive master was Amanda, along with the boat captain, she was excellent, her dive briefing were clear and I really enjoyed accompanying her underwater. She made a point of telling us where the reef should be and we never had to worry about where our stuff was, it was fine just to be left on the boat.